Vogue Italia unveils its September 2012 cover with the effortlessly gorgeous and multi-dimensional supermodel Carolyn Murphy as its star. 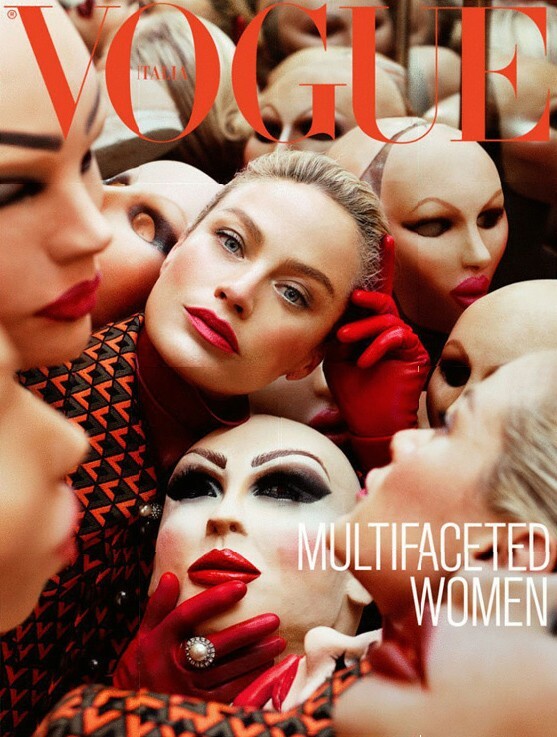 Photographer Steven Meisel captures Murphy with her flawless visage perched amidst a sea of mannequin masks whilst bearing an enquiring gaze. Murphy who recently turned thirty-nine, has been a muse to Meisel since posing for him for the first time in 1995 for American Vogue. Murphy reveals to Italia Vogue "I just love working with Steven and I love working for Italian Vogue because you just always know that it's going to be a work of art and creativity, and a different form of expression than fashion." Murphy who has been modelling since 1989, reminisces to Vogue Italia about her early modelling days and divulges her thoughts about the current state of modelling, "We had a really creative era in the beginning of the nineties, it was all about diversity with Kate and Amber and Shalom, all different shapes and heights... I don't really know now what the business is about today. I feel like the girls on the runway are beautiful but they're quite thin. And I think there's an issue with that. It sends a message to young ladies like my daughter who is only eleven, that you have to be this way. I would love to see more diversity, ethnicity, shapes, sizes. I would love to see more personality, I'd love to see a supermodel, a real supermodel come back. I don't think that we've had one in a while."